How Does It Compare To Other Exercises? Hover over the area of the ElliptiGO bike component that you want to learn more about. This video shows how to adjust the Shimano Alfine hub on the ElliptiGO 8-speed elliptical bicycle. This video will show you how to adjust the brakes using the barrel adjuster and adjustment screws. This video shows how to remove the rear wheel from the ElliptiGO 8-speed elliptical bicycle. Video shows how to rotate crank arm while changing the stride length to prevent cross-threading the crank arm. This is a short video depicting how to properly extend and retract the ElliptiGO elliptical bicycle kickstand. This is a short video depicting how to properly adjust the handlebar height on the ElliptiGO 8S or 11R outdoor elliptical bike. 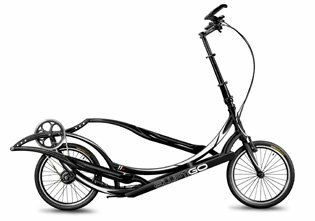 This short video shows how to properly raise and lower the folding steering column on the ElliptiGO 8S or 11R. This is a short video depicting how to properly operate the quick release systems on the ElliptiGO. This is a short video depicting how to properly install the front wheel on the ElliptiGO elliptical bicycle. This is a short video depicting how to properly remove the front wheel on the ElliptiGO Elliptical Bicycle. This is a short video depicting how to properly change a tire on the ElliptiGO elliptical bicycle. This is a short video showing basic maintenance techniques for the ElliptiGO outdoor elliptical bicycle.